source for his paintings after 1970…. 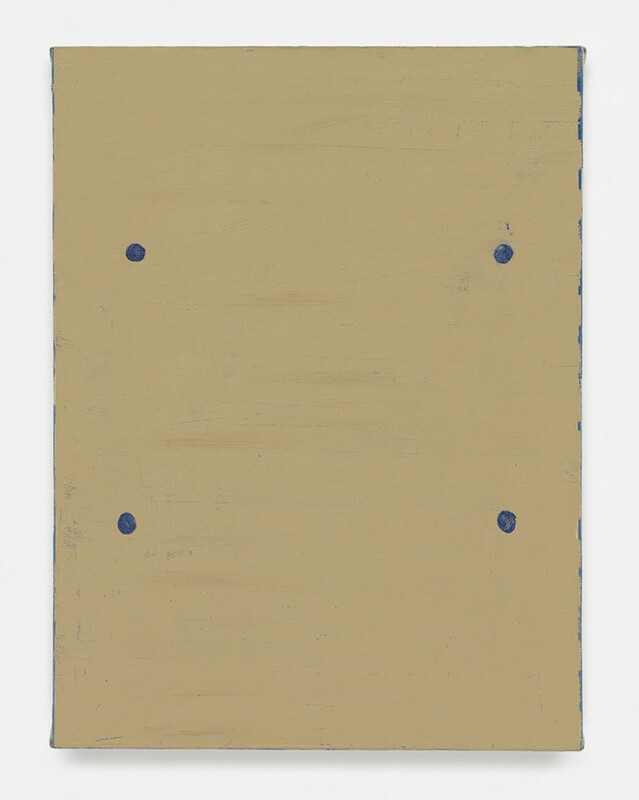 Raoul De Keyser, Under, 2012, oil on canvas mounted on wood panel, 3 3/4 x 7 7/8 inches. 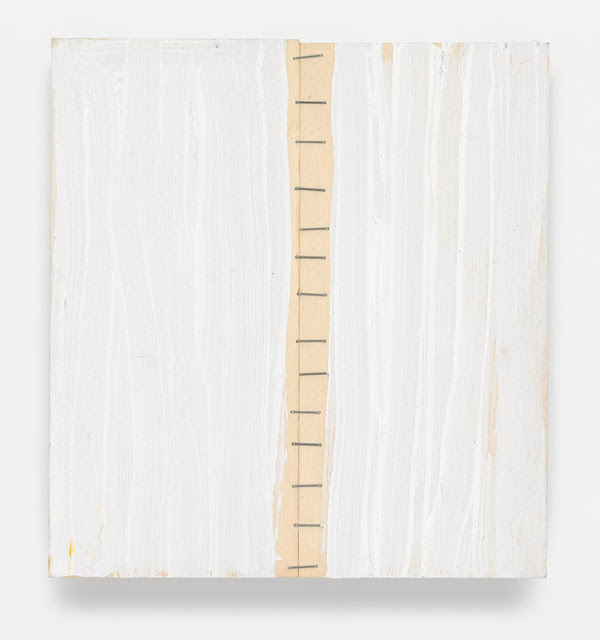 Raoul De Keyser, LI-AI-SON, 2012, gesso and staples on wood panel, 7 7/8 x 7 3/8 inches. 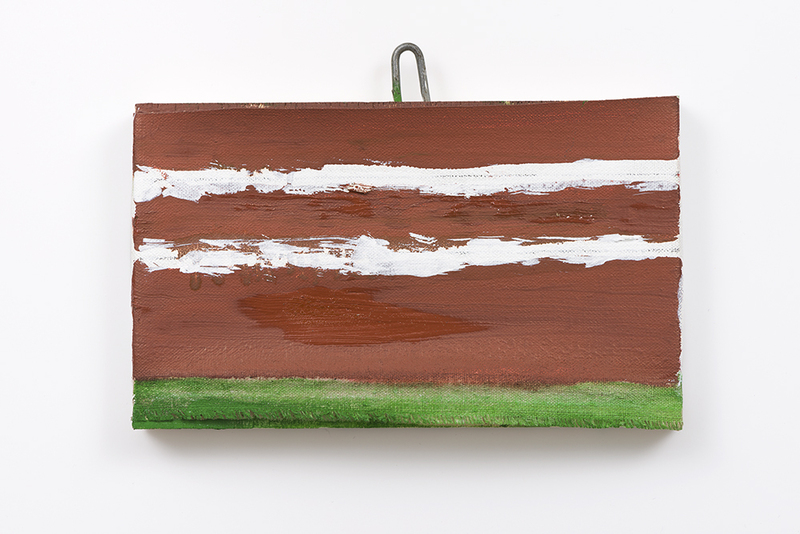 Raoul De Keyser, Over (Rialto), 2012, oil, gesso, and turpentine on canvas mounted on wood panel, 11 1/8 x 8 3/8 inches. De Keyser connects his works to a model, a reference point, a motivation, thus highlighting earlier works, perhaps even critically. But while the paintings are distinguished by a moment of mnemonic recurrence, the referentiality remains strangely inconclusive, since one cannot tell what the model (in this case the linocut) refers to. Because it isn’t clear why the original object was painted—possibilities include the linocut’s relationship to a specific set of circumstances, a moment of emotional engagement on the part of the artist, or an interest in a particular formal arrangement, among many other things—one is left with the general observation that there is a referential relationship of some kind to the artist’s own work. Then attention returns, as if by itself, unbidden, to a colorful picture plane in which oddly shaped figures are embedded like intarsias. A circularity and interdependence runs throughout moments that would seem to be mutually exclusive—the painting’s referentiality and its self-contained presence. It is tempting but not unproblematic to clarify the ambiguity of De Keyser’s painting with the concept of “homeless representation,”  coined by Clement Greenberg in 1962. 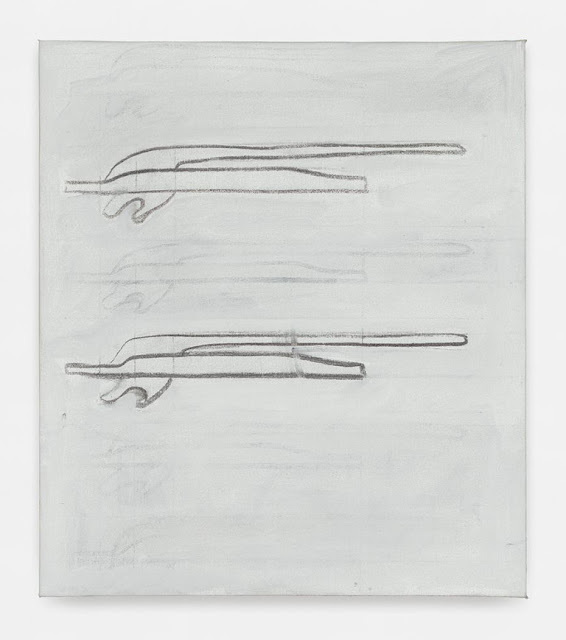 Greenberg used the term to denote “a plastic and descriptive painterliness that is applied to abstract ends, but which continues to suggest representational ones.”  In the case of De Keyser, the autonomy of painting is not an overarching, ultimate goal to be reached by a detour through its opposite. Rather, by referring to other images, De Keyser succeeds in creating a situation in which his painting is kept free from pure subjective construction and is able, through mimesis, to acknowledge a reality outside itself. At the same time, however, autonomy of construction is necessary so that painting does not become a means to an end and lose itself to what it is not. Painting cannot affirm the autonomy of things if it does not possess that autonomy itself. Since in certain cases the objects depicted are his own past images, De Keyser arrives at paintings that have no objective outside themselves. Through a particular kind of self-referentiality, he manages to balance depiction and the autonomy of the image, avoiding a compromise between the two. It is precisely the carefully orchestrated self-referentiality of De Keyser’s paintings that, as [Paul Robbrecht observes in “Paintings Temporarily Leaning Against a Wall,”], keeps them from becoming attached to the place where they are exhibited. This connects them to the work of artists who emerged in the 1980s and are associated with the concept of atopia—from Jan Vercruysse to René Daniëls, from Jean-Marc Bustamante to Reinhard Mucha or Harald Klingelhöller. One might argue that the atopian construction of the work of these and some other artists is a conscious response to the loss of certainty regarding the place of the artwork in the modern era. Raoul De Keyser, Dalton, 1990, oil on canvas, 24 x 18 1/8 inches. Raoul De Keyser, Closerie VIII (Berliner Ensemble), 1998, gesso, charcoal, and fixative on canvas, 24 13/16 x 21 5/8 inches. Regardless of the individual styles of The Last Wall’s paintings—mimetic renderings or self-contained constructions—all refer to models from the artist’s previous work, call those templates to mind, and recapitulate them in reinvigorated forms. The return enacted by the paintings of The Last Wall with a very limited set of painterly tools and techniques is both serious and deeply whimsical. It seals an oeuvre marked by De Keyser’s particular attitude. In many things he did, not just as a painter but in his everyday life, he took specific steps to create a dependence on impulses he did not fully control. In addition to his recourse to earlier paintings, a number of his works point to distinct moments or spaces that informed them. This can be seen in titles (e.g., Bern-Berlin hangend, 1993, ill. p. 41, a reference to two exhibition venues that were especially important to De Keyser at the time, or Dalton, 1990, ill. p. 27, a reference to the four Daltons from the Lucky Luke comics) and subject matter (e.g., his studio’s surroundings that include the monkey puzzle tree outside of the window in the aforementioned Bern-Berlin hangend; the folding grille, Closerie I (Berliner Ensemble), 1998, ill. p. 45 ; or the internal staircase, Untitled, 1998, ill. p. 49). Other works include features that make the image look accidental—like the result of a malfunction, an encounter, an incident, or an experiment—as in the case of traces left by a tube of paint that De Keyser threw at some of his paintings, or a final brushstroke that looks like the letter Z (Z, 1990 ; ill. p. 29). For De Keyser, what is central is not the ideal of the self-contained work. Rather, the paintings create mimetic connections to things outside themselves or incorporate the traces of passing circumstances. But to do justice to the independence of external reality, referentiality is turned into a mode of construction that acts as if nothing existed outside the paintings themselves. Raoul De Keyser, Flooded in Brown, 2012, oil and gesso on canvas mounted on wood panel with U-bolt, 5 7/8 x 8 7/16 inches. 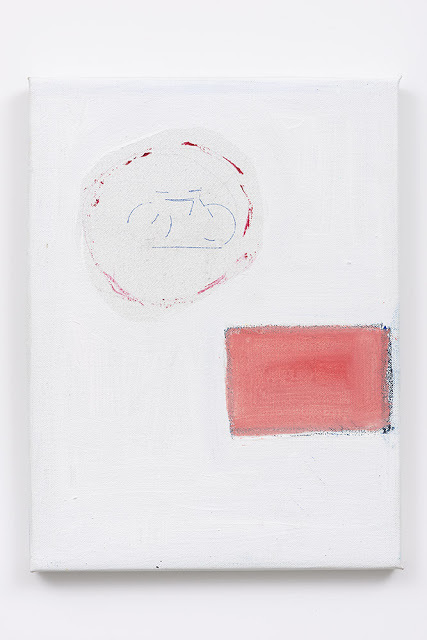 Raoul De Keyser, Two Broken, 2012, oil, gesso, and chalk on canvas mounted on wood panel, 11 x 8 1/4 inches. 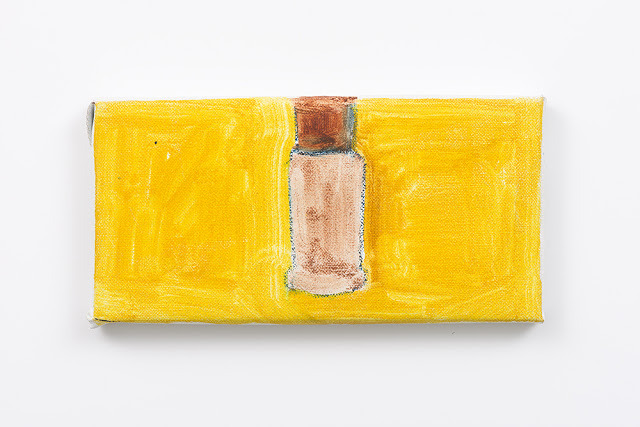 Raoul De Keyser, Playtime?, 2012, oil on canvas mounted on wood panel, 11 7/8 x 8 3/4 inches. 7 5/8 x 10 1/2 inches. See Steven Jacobs, Raoul De Keyser: Retour 1964–2006 (Ghent: Ludion, 2007). This publication’s text is a revised and expanded version of Jacobs’s essay, “What Remains of Depth Is Enveloped in Colour. Raoul De Keyser’s Painting 1964–2000,” in Steven Jacobs, ed., Raoul De Keyser: Paintings 1980–1999 (Ghent and Amsterdam: Ludion, 2000). See Jacobs, Raoul De Keyser: Retour 1964–2006, p. 59 and Robert Storr, “On Knowing One’s Place,” in Raoul De Keyser. 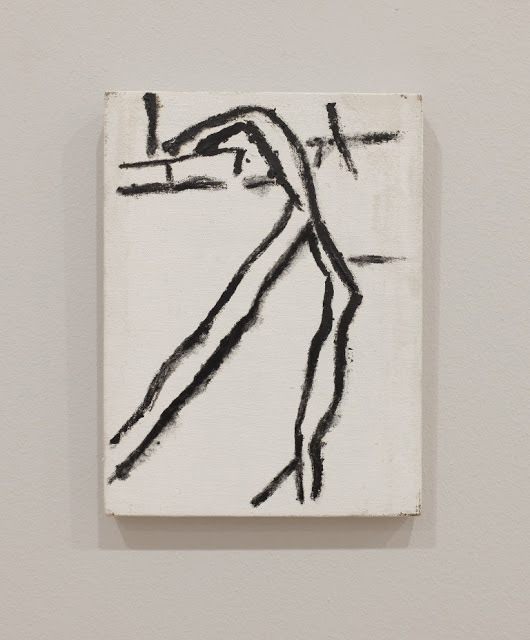 Terminus: Drawings (1979–1982) and Recent Paintings. Exh. cat. 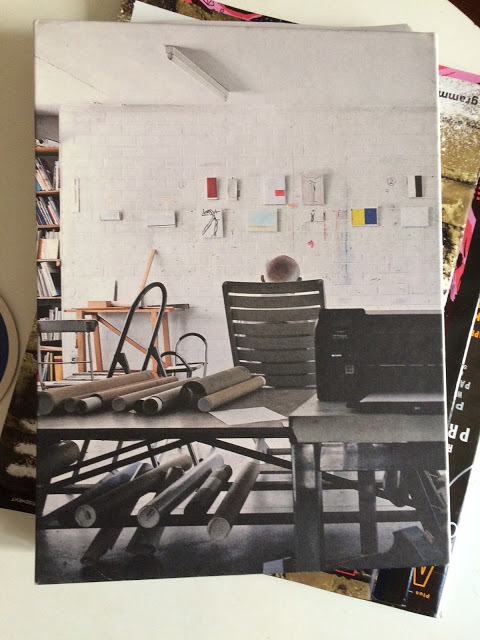 (New York and Göttingen: David Zwirner and Steidl, 2011), n.p. Clement Greenberg, “After Abstract Expressionism,” in John O’Brian, ed., The Collected Essays and Criticism, Volume 4: Modernism with a Vengeance 1957–1969 (Chicago and London: The University of Chicago Press, 1993), p. 124. 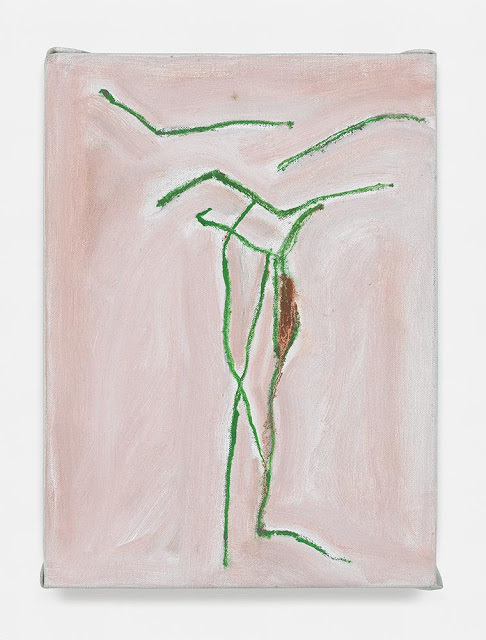 See Roland Jooris, “Precipitations : Excerpts on De Keyser’s Work from My Artists’ Logbook,” in Raoul De Keyser: Paintings 1980–1999, pp. 78–83. First published as “Uit mijn plastisch logboek bij het werk van Raoul De Keyser,” in Raoul De Keyser 1979–1985 (Brussels: Museumfonds van het Ministerie van de Vlaamse Gemeenschap, 1986), pp. 7–11. 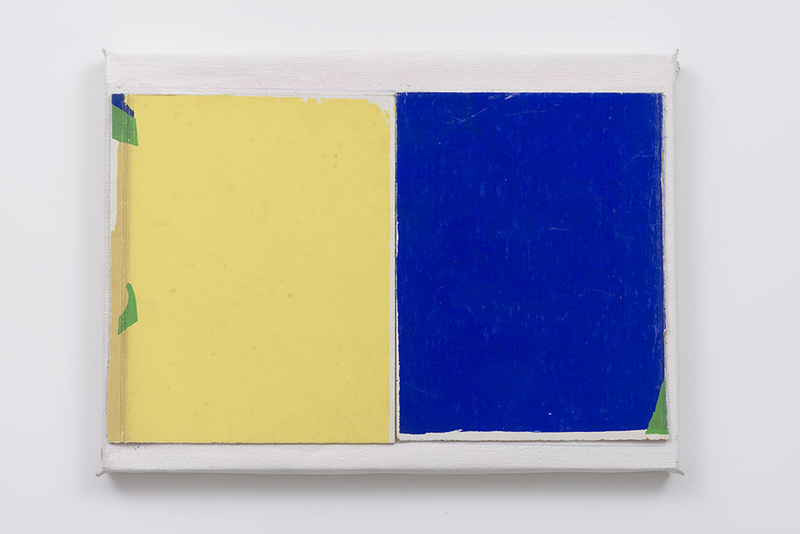 Jacobs, Raoul De Keyser: Retour 1964–2006, p. 11. “Raoul De Keyser: Drift,” curated by Ulrich Loock. David Zwirner, Chelsea, New York, NY. Through April 23, 2016.